The common belief (as expressed in that tweet) seems to be, “Yes!” But I’ve always had my doubts. It does seem like an abuse of “infinite” to me. A “straight” encoding (ASCII or Unicode) seems like it would be too structured to ever appear as is, but then I wonder about a compressed encoding, which would lack the patterns of uncompressed text. Two main things to think about there. Firstly, if Pi is normal, then the complete works of Shakespeare appear within it, with every single encoding you can think of… eventually. A normal number contains *every* finite sequence of digits, so no matter what digits end up standing for Shakespeare works, they’re in there. Same goes for the obvious circle image. But we don’t know whether Pi is normal, so we don’t know that every sub-sequence pops up eventually. Thus, no reason to think the circle image has to come up. On the other hand, if we’re allowed *any* encoding… the Shakespeare question becomes rather trivial. If 1=the complete works of Shakespeare, then the complete works of Shakespeare are encoded in the 2nd digit. If you restrict yourself to widely used encoding and compression algorithms, you’re back to guessing. We have no reason to think it *has* to happen, but also no reason to think it wouldn’t. I’m glad you’ve written this up. I may need to carry cards around with a link to this. Even SMBC gets it wrong https://medium.com/the-nib/a2ac3c553d47 . 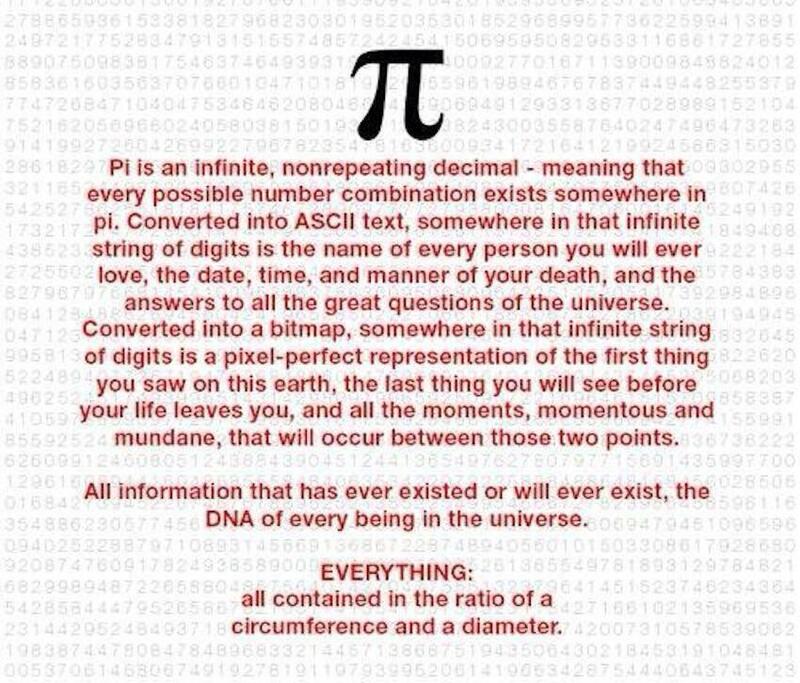 Maybe most people reading that think pi contains everything because its representation is infinitely long, which is wrong. Isn’t pi believed to be normal, though? I thought that meant the digits are randomly distributed. If that’s the case, then every finite-length string should appear eventually. IIRC Marcus du Sautoy makes the claim that any finite sequence of digits can be found in PI in his The Code documentary. Just a minor nitpick: Isn’t “finite integer” redundant? There’s no such thing as an “infinite integer” as far as I know. Uhm… You wanna walk this back a little? The soul of mathematics is precision, after all. When you’re dealing with cranks you can’t leave such a giant gap in in your reasoning just because it’s sounds like a more satisfying smackdown. But not every finite string of digits is a *normalized* (in the sense of no leading zeros) representation of a natural number — thus your explanation here, which seems to conflate these two notions, falls short in its goal. Of course, all you need to do to fix the explanation is to point out that any non-normalized decimal representation of a natural number is contained within a normalized one (by simply prepending a leading “1” or any other nonzero digit in front of it), and thus is also guaranteed to show up in the sequence you describe. Thus is the soul of mathematics preserved once again. I think a little more specificity wouldn’t hurt. After all, the digits of the decimal expansion of pi may very well contain the digits of the decimal expansion of e as a computable subsequence, though not necessarily as a consecutive subsequence. In fact, it’s trivial to prove that the digits of the binary expansion of pi contains the digits of the binary expansion of e as a subsequence if we simply ignore the radix point (all you need to know is that an irrational number has an infinite nonrepeating expansion when expressed in any integer base greater than 1, not only decimal). With that said, it’s generally really hard to prove that any given irrational number is normal. This is one of those wonderful (/infuriating) math proofs in the vein of “something exists, but don’t ask me to find a non-trivial example”. And I believe that creating a number that is normal in all bases is apparently a really difficult challenge. 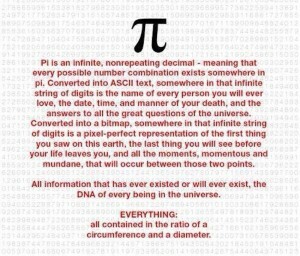 So to me, pi* would be MORE interesting if it WASN’T normal. And though the idea of trying to hide some inner message in it seems pretty silly to me (how would you possibly make it have any other value?) a la Contact, I personally think a cuter way to “hide” such a message would be to have some number sequence that didn’t exist anywhere in the number. Now that would be a challenge to find. *Or tau, the superior constant. Does that require that the DNA and PNG also be normal? WRT Contact, the implication was that whatever created the universe created it such that messages were hidden in pi and e and other transcendentals. It’s about the only way that would be possible. Also a big fan of Tau…. Tau day (6/28) is coming up! Normality, applied to an infinitely long sequence means that all finite-length subsequences are equally likely. If that’s true, then if you follow the sequence out far enough, you’ll be able to find any desired finite sub-sequence. The finite-subsequences don’t need to fit any profiles except finiteness. If the sequence is truly normal and infinitely long, then it will, eventually, include every possible subsequence. So, just to make sure I’m completely clear on this, IF pi is normal (and we suspect it is), then it does contain any finite sequence of numbers I can imagine, including the raster pattern from Contact, the complete works of Shakespeare directly encoded into ASCII and a sequence of one-million zeros. But this isn’t particularly significant, because any normal real number has the same sequences somewhere in its digits. And almost all real numbers are normal. e is found in pi in the sense of the post if you assume its normality. You can write an expression in ASCII (TeX) that describes e exactly. That reminds me of a classic example of what constitutes a computable function in the sense of the general theory of algorithms. Suppose that Foo(n) is defined to return 1 if the decimal expansion of pi contains a run of at least n consecutive 7’s, and 0 otherwise. Is Foo() computable? Yes. So Foo() is certainly computable because there is a program that computes it. We just don't know which program it is. For some reason, this example always winds people up. there is this concept that just because something is infinite, it must be ‘more’ in some sense: it must contain everything. this view is not stupid, just misguided. here is an example: in probability theory, when working with continuous time stochastic processes, one abides to this view: you saturate a filtration by making the sigma-algebra right-continuous and include the null sets of the associated natural filtration with respect to the measure. we get something that is ‘complete’ (or saturated) by putting more in. when you tell people about something non-infinite (finite) yet totally random, then a little switch goes off: wait.. its countable, i can understand it, but it’s still random? (for example, observing particles at a microscopic scale with measuring equipment, i.e. uncertainty) maybe it’s a case of not knowing randomness! to the author: have you read the book “thinking fast and slow” by daniel kahneman? I’m not looking for anything. I’m describing something that is.